LA CRESCENTA, CA  Some young people have a lot to say, others shy from the spotlight but share their emotions and thoughts through the printed word or on canvas. Whether they wanted to sing, recite, show their paintings or try their hand at humor, about 100 young people gathered on Saturday, May 8, to enjoy the AYFs Artistic Uprising Open Mic Night. Organized for the fourth year by the AYF La Crescenta Zartonk chapter, Open Mic Night invited young people from throughout Southern California to share their talents. Hosts Gaianeh Avanessian and Levon Abrahamian were more than masters of ceremonies. They promoted laughter with their humorous dialogue and bickering during the show. Bringing music and soulful beats throughout the night was AYF alumnus Knar Kitabjian, who spun CDs and was the DJ of the night. The self-expression wasnt confined to what was happening on stage during Open Mic Night. Decorations for the hall were pieces of art lovingly created by Naris Azaryan. And there was even a magic act by Hayk Dilanian. Known as HD Magic, Hayk dazzled the audience with a suspenseful skit that put a twist on the typical pick the right cup routine. Singing Armenian songs was Nayiri Balian, who was accompanied by Vahe Lepedjian on keyboard and George Baltakian on drums. Christina Gharibian brought a Middle Eastern vibe to the event, belly dancing to traditional Arabic music as well as to contemporary hip hop. The band Prisoners of Disguise rocked the audience with a set of original songs they wrote and composed. Bedig Atmajian riled up the audience by singing Armenian Revolutionary songs. Donning traditional Armenian folk attire, Gaianeh Avanessian and Lara Panossian performed a number of Armenian dances. Alex Minassian and Vache Thomassian both moved the audience individually with original poetry. Alex Minassians poetry was of a more personal nature, dealing with issues of love and understanding enigmatic people. Vache Thomassians poetry on the other hand was his personal reaction and outrage to the tragic story of Mike Yepremyan, a 19-year-old Armenian who was shot to death in a Sears parking lot in North Hollywood by another Armenian after they argued about a text message. Hiebert Sarian, one of the lead singers of the popular Armenain folk band Element, wrapped up the event with his performance. Hiebert sang classical songs from Gomidas with the help of one of his former music school classmates. He also had a little help with the AYFs own Arek Santikian on the drums. We were lucky to have so many willing artists be a part of the show, said show host Gaianeh Avanessian. 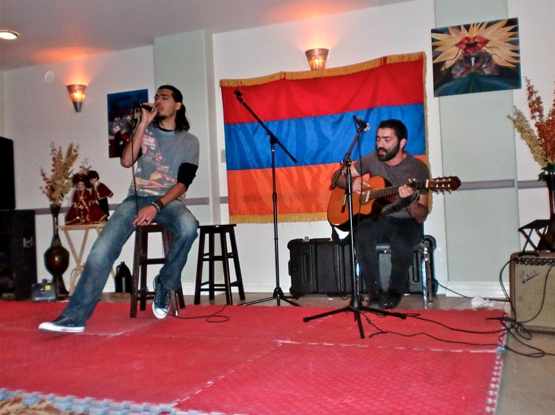 Organizers of Open Mic Night believe these popular events are another great way that the AYF brings people with a common background together.